“Platforms” and “online intermediaries” are creatures of the digital era that IP policy-makers and lawyers have come to know rather well […or have they ?]. And indeed, there is a plethora of scholarly work available on the Napsters, Googles and YouTubes of this world. And now there is a new genre of platforms that is catching the attention of intellectual property experts and policy-makers: the platforms of the “gig economy”, with Uber as the poster child. 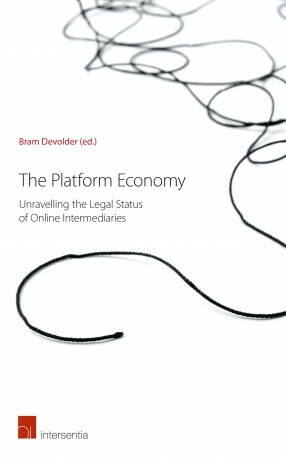 “The Platform Economy – Unraveling the Legal Status of Online Intermediaries”, editor Bram Devolder, introduces us to the main legal challenged posed by this new generation of platforms. WARNING: This book is actually not directly about intellectual property BUT [don’t go anywhere!] it is this Kat’s feline intuition that the topic will be of growing importance to the intellectual property industries (notably the copyright industries). Hence this IPKat review of the book, which is highly recommended for readers interested in staying attuned to market trends that may help spawn the intellectual property issues of tomorrow. Part I offers a clear introduction to the “gig economy”: and the key players in this market (Chapter 1 by Alain Strowel and Wouter Vergote); issues of contractual liability (Chapter 2 by Bram Devolder); the concept of ‘law evasion’ (Chapter 3 by Nicolas Van Damme) and reports on the experience of China in regulating this type of platform (Chapter 4 by Liyang Hou). Part II then focuses on challenges posed by these platforms in light of European Union law, specifically looking at competition law (Chapter 1 by Feriso Bostoen) and the Draft Model rules on Online Intermediary Platforms (Chapter 2 by Marie Jull Sorensen). Part III is entirely centred on the platform economy’s consequences on employment law and social security protection. Last but not least, Part IV is dedicated to issues of taxation in relation to transactions via the platform. As readers can see, the edited collection covers a comprehensive range of topics without being repetitive, no easy task considering that it features 13 chapters in total. The “platform economy”: …which platforms? …which economy? A myriad of names have been coined to label the platforms forming the “gig economy”. These names include “platforms of the sharing economy”, …“ the collaborative economy”, … “ the P2P economy” [read: peer-to-peer economy], and …“the mesh economy.” Whatever the term, all of them refer to online intermediaries such as Uber, AirBnb, and TaskRabbit. (2) They operate for profit. (3) They control over the transaction it enables by connecting buyers and suppliers of goods, services, workforce. etc. (4) They grant access to a good, a service, workforce etc., which will also be performed off-line. As these platforms have garnered economic momentum, they are severely disrupting their respective markets and the associated ‘specialist’ regulation that goes with them. For example, Uber took transport regulation by a storm by managing to bypass license-based taxi legislation. The successes of Uber, Deliveroo or TaskRabbit have invited courts and legislators to modify employment law. The impact of AirBnB on housing markets calls for a reform of local housing policies and regulations, and so forth. Moreover, this new generation of online intermediaries pose two other, more general, legal challenges. The first concerns liability for non-performance or liability when “something goes wrong”. Who is liable? The platform or the user [if so which user?] of the platform? The second regards taxation: how should we tax the service provided by the parties involved in a transaction managed by a platform like Uber or AirBnB? In both cases, liability and taxation, it is the triangular structure of the relationship between the platform, the buyer of goods/services and the supplier of goods/services that is at the crux of the legal challenge. 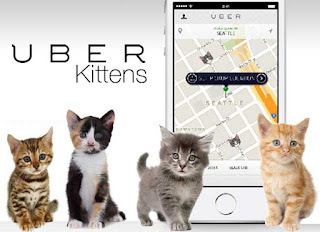 As such, the answer to ‘who is liable’ or ‘who is taxable and how’ will depend on whether we consider Uber to be the supplier of transport in law, or merely an online matchmaker between two independent parties using the app (the user and the driver). Although courts have started to address this issue, at present there is no judicial consensus on these matters. Where does IP fits in all this? Well, nowhere directly. As noted earlier, this edited collection covers an impressive range of topics but intellectual property is not one of them. So why should Kat readers be interested in this book? At the very least, this Kat believes, because uber-like platforms have recently branched out into supply of bespoke creative content offering “workers on tap” who are also intellectual property rightsholders (copyright or performers’ rights). As covered in a previous blog, see here, such ‘platformization’ of the creative industries comes with the risk that extremely low rates for the transfer of intellectual property rights will become the ‘norm’, dampening any hope for artists to reasonably monetise their rights. If this ‘platformization’ catches on, this may be the end of the hope that copyright and performers’ rights ensure fair remuneration. Who is this book for? This book is for anyone interested in keeping an eye on the legal developments associated with the “platform economy”. The clarity of writing offers an easy and enjoyable read on ostensibly technical subjects (employment law, social security law, taxation, and contract). The book achieves a good balance between descriptive content and expert analysis on the topic at hand, making it accessible law from law students to policy-makers or practitioners. 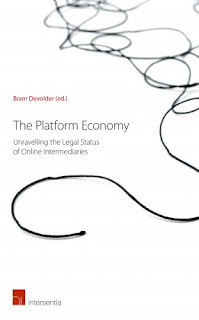 Book reviewed: Bram Devolder (ed) The Platform Economy. Unraveling the Legal Status of Online Intermediaries, Pp. xxii + 398 pp. Cambridge – Antwerp – Chicago: Intersentia. More information available here. Hardback: 95euros. Online version available via Jurisquare.